The Auburn University School of Forestry and Wildlife Sciences has announced the retirement of three faculty this year. Professors Brenda Allen, Arthur Chappelka and Larry Teeter will retire as of Dec. 31. Professor Chappelka was hired in the School of Forestry and Wildlife Sciences in 1987. The major emphasis of Chappelka's research has focused on understanding the effects of environmental stresses, including air pollution on the growth and productivity of native and urban-forested ecosystems. In addition to teaching, Chappelka has served as the school’s interim associate dean of research, chair of the Auburn University Faculty Research Committee, and Alumni Professor. He is currently chair of the Auburn University Tree Preservation Committee. Professor Teeter has been a faculty member at Auburn since 1985 teaching forest management, policy, economics, and geographic information systems, or GIS. His research focused on economic impact assessments, timber inventory/supply analysis, private landowner decision making and the use of GIS in resource management. On campus, Teeter has served on numerous university and senate committees, most recently as chair-elect, chair and immediate past chair of the University Faculty and Senate. Also retiring is Extension Specialist and Assistant Professor Brenda Allen who joined the School of Forestry and Wildlife Sciences faculty in 1997 with a split appointment between teaching and Extension. Allen taught Urban Forestry and Environmental Ethics and served as Extension Specialist in Urban Forestry for the Alabama Cooperative Extension System. Allen’s focus areas include tree protection and preservation on construction sites, local tree ordinances and tree legislation and capacity building for leadership in local tree advocacy and stewardship initiatives. Allen has served on numerous discipline-related boards and advisory groups at the state, regional and national levels, and currently serves as faculty advisor for the Auburn University student organization, Minorities in Agriculture, Natural Resources and Related Sciences, or MANRRS. 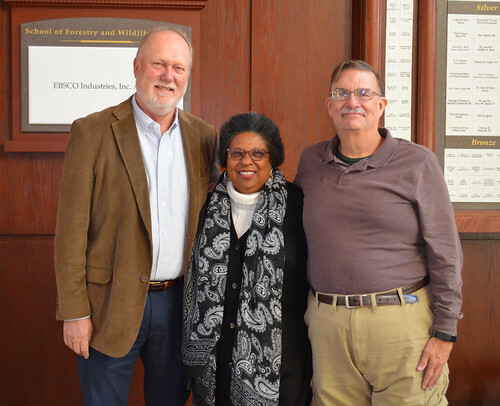 Auburn University School of Forestry and Wildlife Sciences retiring faculty include, from left to right, Professors Larry Teeter, Brenda Allen and Arthur Chappelka.